I’ve been working on my ability to photograph quilts by myself. Quilt photography is very tricky and a bit expensive if you have to pay for it. However, it’s worth every penny to get a photo that will really show a quilt in its best light. I recently got a portable quilt-hanger, and now I feel like I can really get good photos. I know I still need work, and a better camera always helps… but for what I have, I think these are pretty good. Below find new final photos of the Vishuddha Quilt I finished last year, as well as the full photo for Neopolitan Interlaced Orbs… not too bad – eh? Vishuddha Quilt Label – hand printed by my husband Gregg. I’m finishing another revolution soon, and it’s a big one. I don’t know how to feel about it. Being older is strange. I never expected to make it past age 25… so this is double-bonus-plus! Turning 1 with paternal grandparents. Grandfather suffered from Alzheimers – he was always giggling in photos. It’s been a very interesting new year so far. Spent the first two weeks so sick – it hurt my head to think. Still, I was able to be productive, and created a new site for our T-shirt printing business. I’m quite proud of it, it was my first foray into PHP coding – and while there were times I wanted to pull my hair out, I got it figured out and working pretty well. This time of year means it’s tax time – or paperwork/accounting time for me. 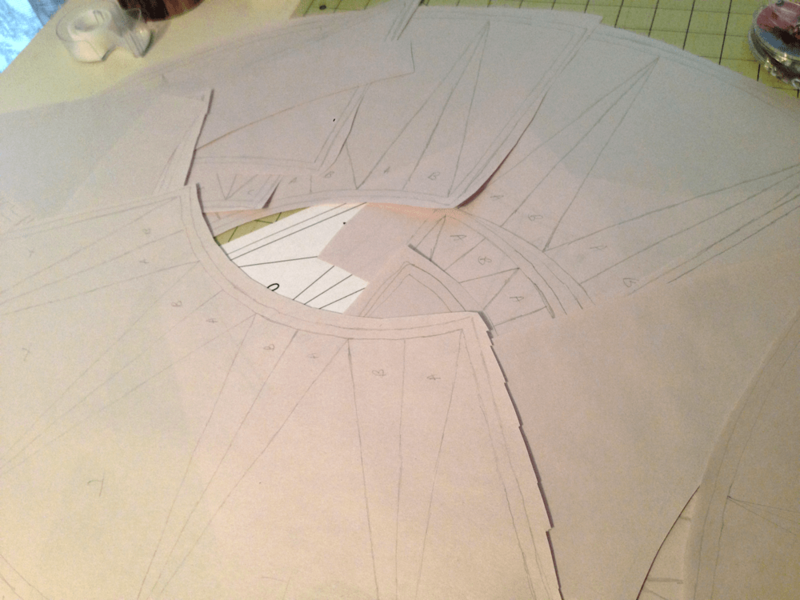 Between that and the new site, I haven’t been working on any new sewing projects – and I’m going a little crazy. 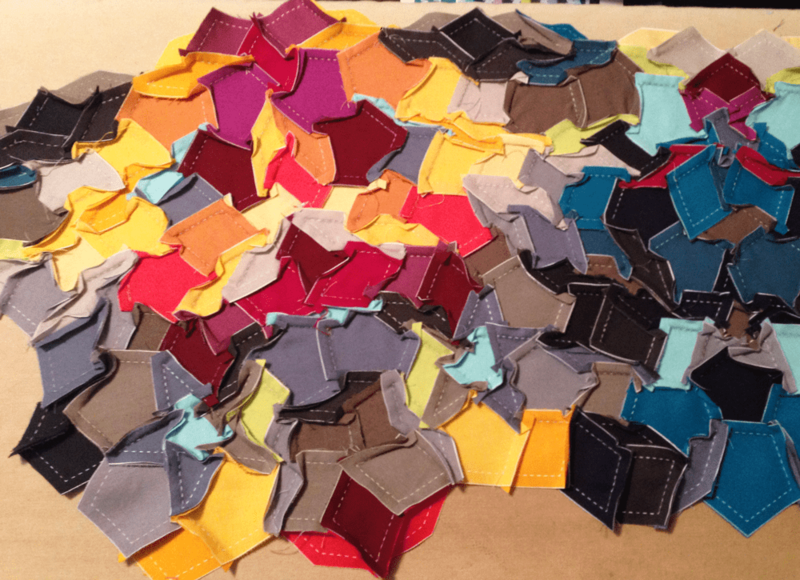 I have a few ideas in my head for what I want to work on, but I’m having a hard time starting another Chakra quilt. They are emotionally heavy. 1984. Age 15 with parents and 3 younger sisters at Bible-Study. My brother was born after I left home, when I was 18. No full family photo exists. Yeah… still stuck on family issues. Every time I start working on emotional balance in my life, it always comes back to these people, and how much damage they caused. Honestly – I’m kinda tired of them and thinking about them and their religion, and how their religion (cult) has them so brainwashed. Yet at the same time, I have to think about it in order to ‘let it go’. Kind of a catch 22. This is the basis of my Chakra quilt series: To heal from the grief of conditional love and intentional loss by immediate family. It’s hard to have family treat you as if you’re dead to them… for decades. They will never talk to me again. There comes a point where you have to stop trying and face facts. Fact is: I need to say goodbye, feel the grief, and move on. 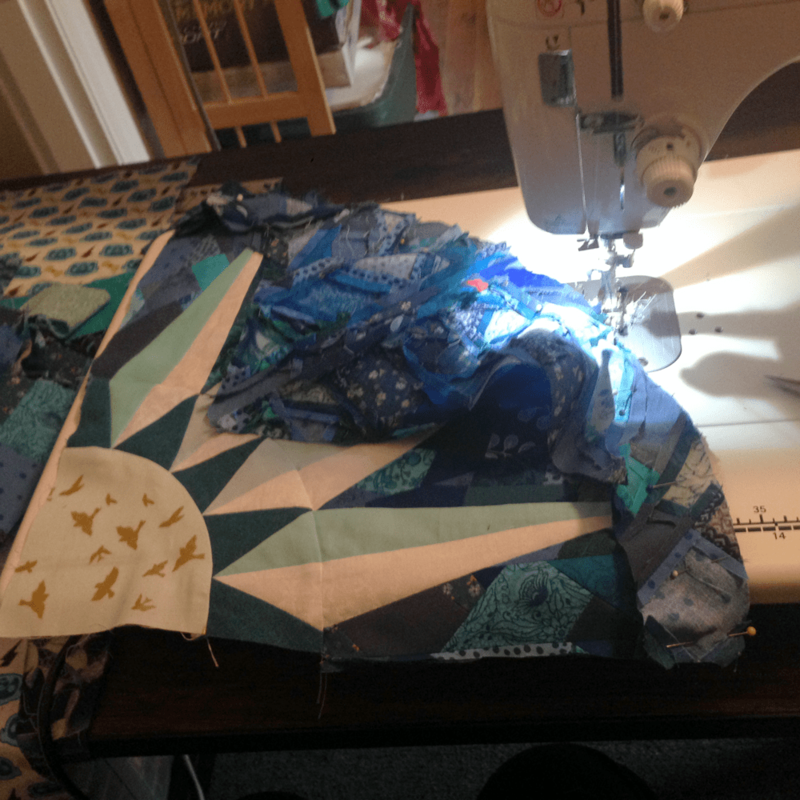 Each quilt so far has been intensive and a step in that mindful disconnection to family – and I’m doing the easier ones first. I know by starting another in this series, it will mean more introspection and reflection – and that can be difficult. My goal is to have all 7 major Chakras represented in quilts. Represented by how they affect me personally, and what resonates for what I need for my own emotional healing. Each one takes me on its own journey. 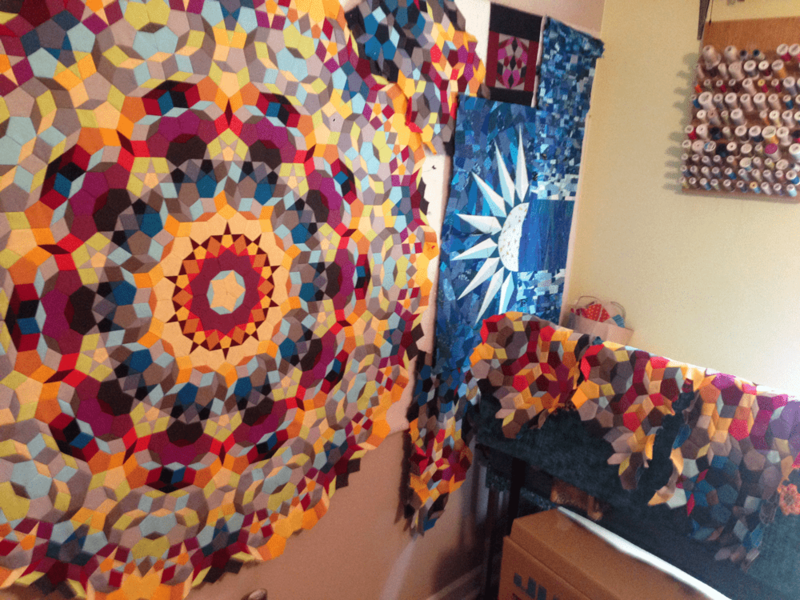 Right now the 6th Chakra is the one I’m thinking about most – so a Purple quilt may be next up in this process. I study the Chakra as I’m creating – I use mantras to positively influence my work and to open my mind to different perspectives. 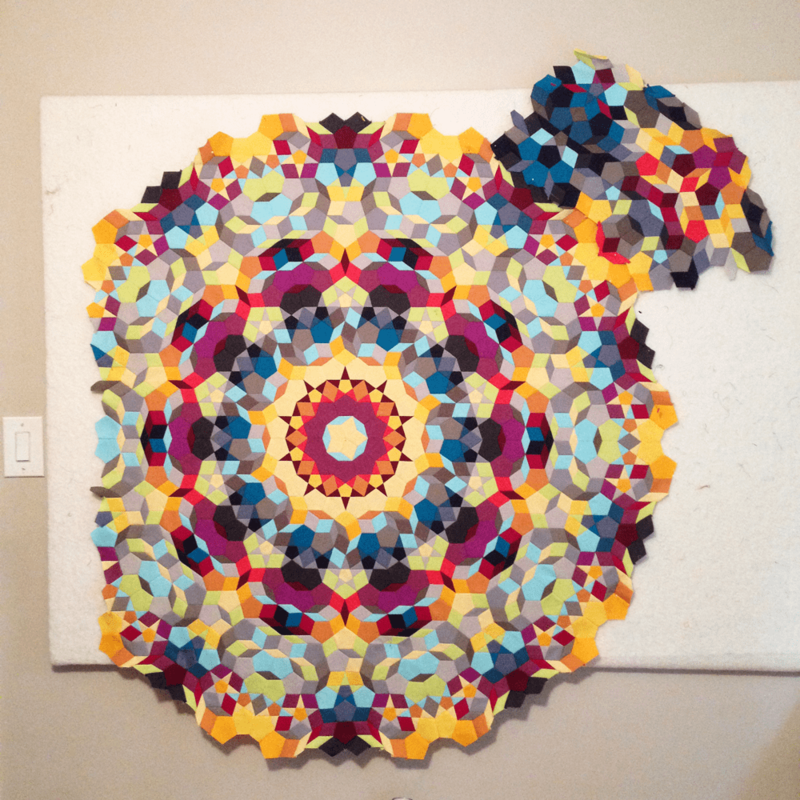 I try to symbolize my thoughts and feelings into the imagery of each quilt. It’s been an amazing process so far. I’ve been working a lot lately which leaves little room for writing. Not just work work, but emotional healing work too. I’ve been getting close to finishing the top of my Vishuddha Quilt and I’m very happy with how it’s turning out, and how I feel when I look at it. String of fabric bits to add to my Throat Chakra Quilt. We watched Leah Remini: The Jehovah’s Witnesses last night. It aired on A&E and is probably still accessible, and if you’re interested in what the JW’s are all about – this is an excellent program. It touched on all the main problems I have with that religion, and the control it has over its followers. 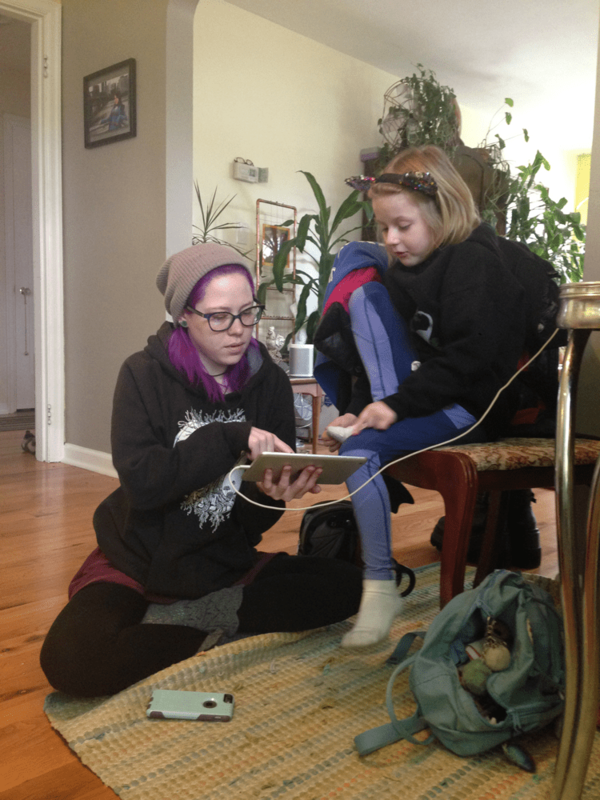 Seeing video of that lifestyle, and those speakers – it stimulated all sorts of memories. It’s still hard… and I really don’t want to think about it much anymore – but there are some real feelings there that I need to address. What makes it hard to work through is that most people you might talk to have no idea what it was like growing up in that environment, they don’t have any real advice on how to recover. I’ve been wanting to just ‘be normal’ and enjoy being around people. Unfortunately, I get overwhelmed so easily, so in groups I have a hard time focusing on one-on-one conversations. My anxiety hasn’t been that bad lately – and for that I am so grateful!! The issue that’s bugging me now is just how tired I get all the time. I feel like I can’t get enough sleep… and when I eat, I have to be ready to nap – because when my body is digesting, I have no energy at all. This makes me super spacey and it’s hard to get focused on any project… or on any conversations. 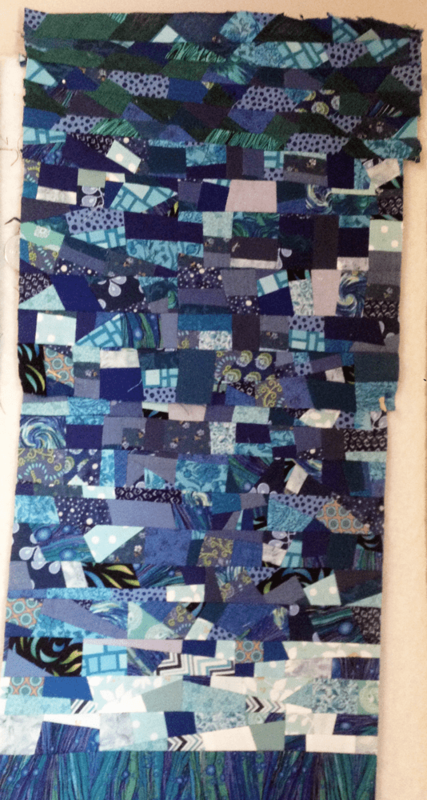 My Throat Chakra Quilt on the design wall – in progress. 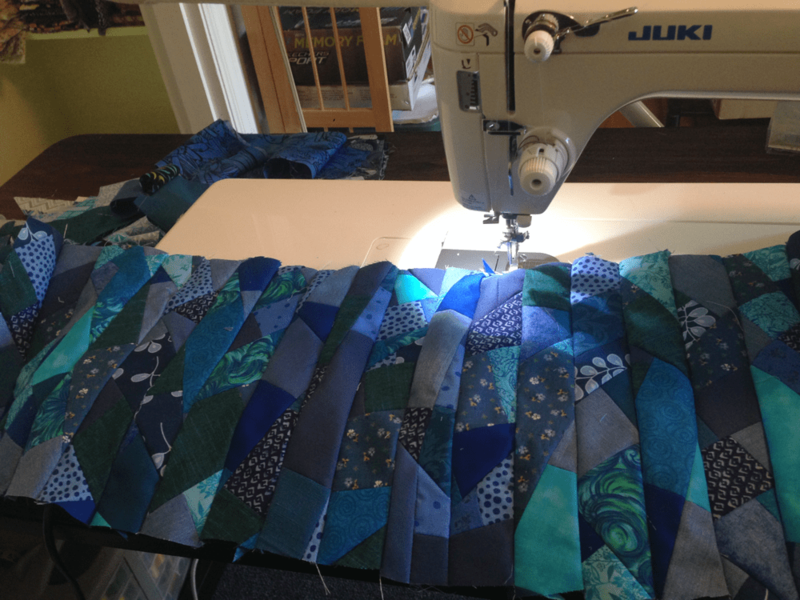 So I’ve been working on the Throat Chakra quilt and letting all this emotional crap work itself out while I’m sewing. I have been tears and shouting with frustration and anger and love and more frustration while working on this. It’s a personal piece. It is me. How many times have I cut myself apart and put the pieces back together hoping something different would come of it? Too many times to count. Every time being necessary. I’m wondering if I will even post this. I’ve been writing a post almost every other day for a while, but haven’t published any of them. They are all so depressing. I guess that’s what happens when you’re feeling blue. Quite literally too – feeling blue. 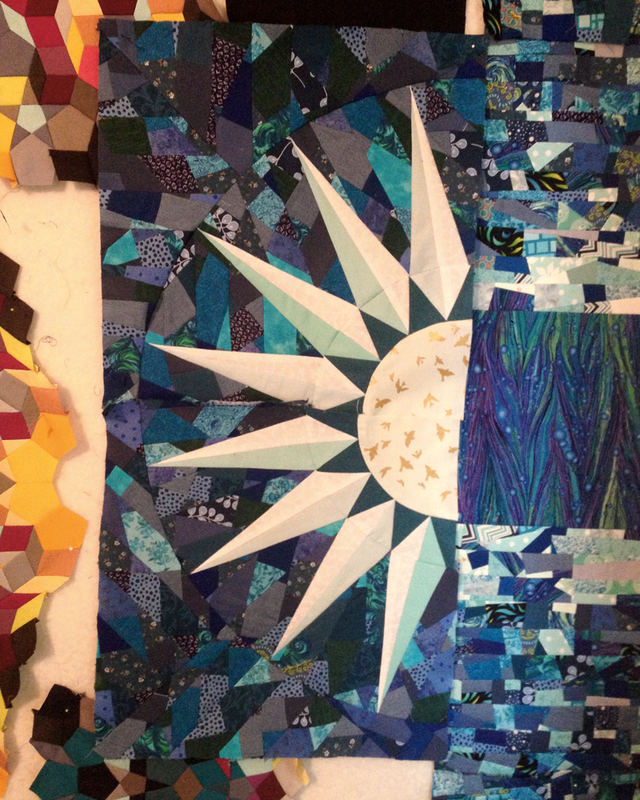 I’ve been working on my Vishuddha Quilt and it’s slowly (but beautifully) coming along. 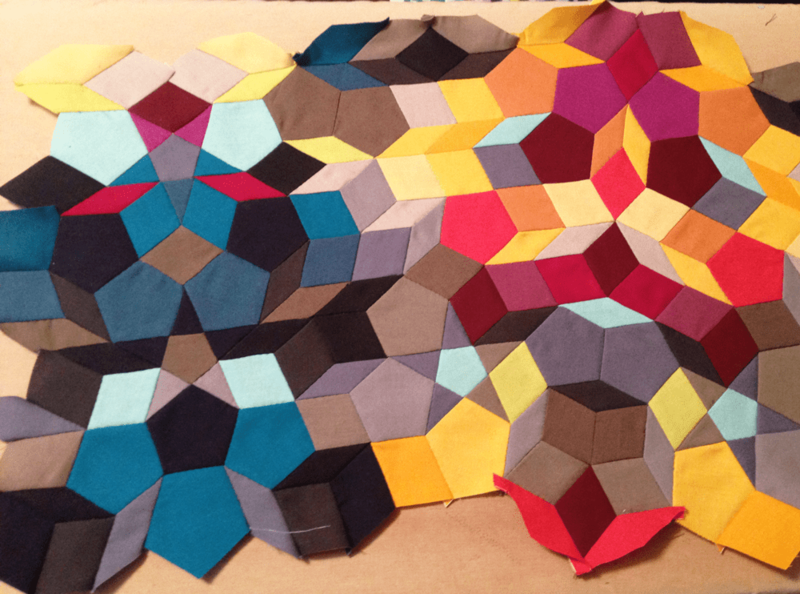 It’s such a slow process, but that’s what this quilt is asking for. The Throat Chakra (Vishuddha) is the 5th major Chakra of the body and it is all about speaking out – speaking your truth. This is something I have difficulty with as I don’t really even know what my truth is. I’m still in a healing phase, and feeling a little lost emotionally. There are a lot of things coming up in counseling and in my body / energy work that are difficult to process. There are big hurdles. Even though it has been a long time since I’ve had any mental or emotional trauma, I guess I still carry quite a load. I’m really ready to drop it all, heal, start fresh. My counselor asked if I hadn’t been raised the way I was, and money & health weren’t issues, what would I want to do with my life… what did I want to be when I was a kid before being brainwashed? This question is extremely difficult, and I still have no answer. Before I go off on another ‘feel sorry for me’ tangent, I’m stopping myself and am going to share pictures of the Vishuddha Quilt in progress instead! Then I’ll be able to publish a post this month! 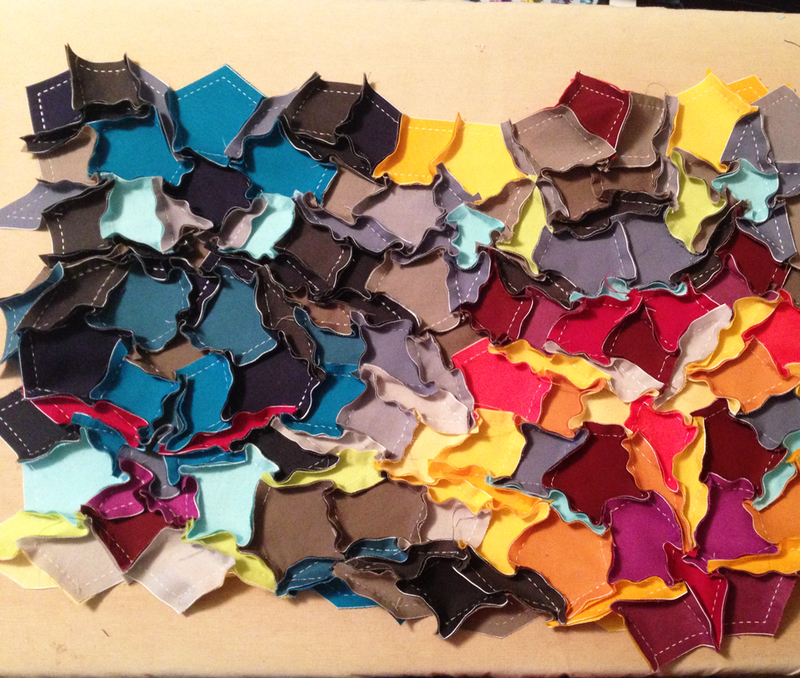 Finally a plan for my Vishuddha Quilt is starting to come together in my head. 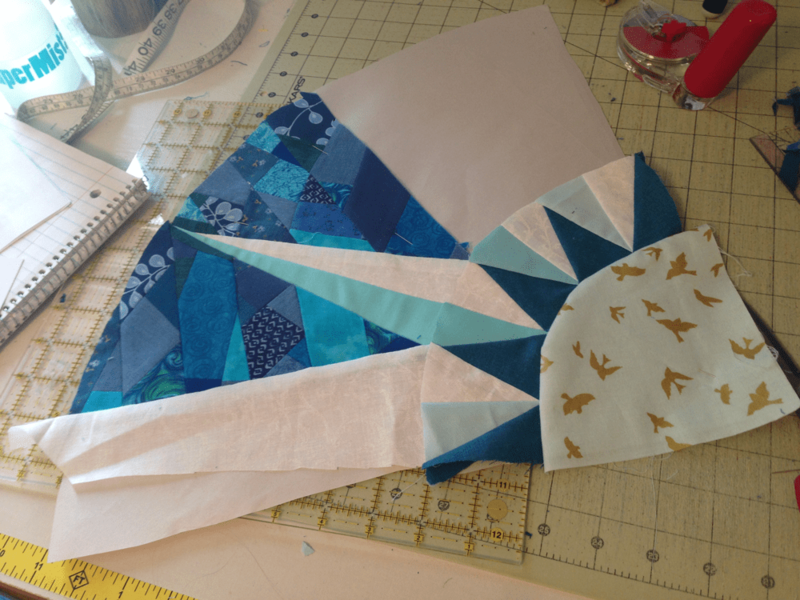 I make things a little more difficult by trying to only use what fabrics I have on hand… but that also makes for a more interesting quilt! The Throat Chakra (Vishuddha) is energetically based in the neck region and is connected to our power of communication. It also connects our physical attributes with our mental ones. When this chakra is blocked we can experience fear of conflict, inability to speak up or speak out when necessary, and more physically: neck, jaw, and shoulder pain – and thyroid problems. So I’ve been envisioning the shape of the thyroid gland as a base design element. It’s often described as being the shape of a butterfly – and I’m also thinking of the pattern metal shavings make with a magnetic field. 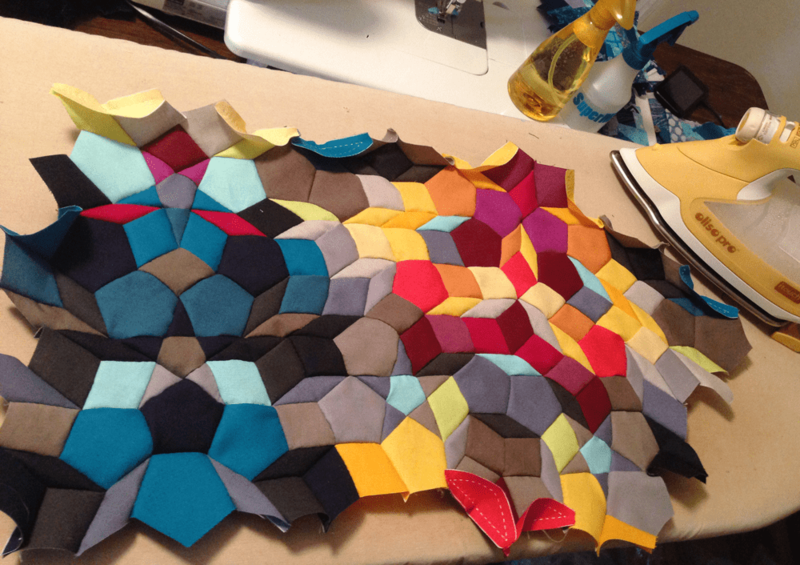 I was having a hard time translating that look to a quilt pattern idea… but I think I got it! I’m going to try a New York Beauty Block – make it big and split it down the center. The color associated with this chakra is blue – a more aqua blue to be exact. 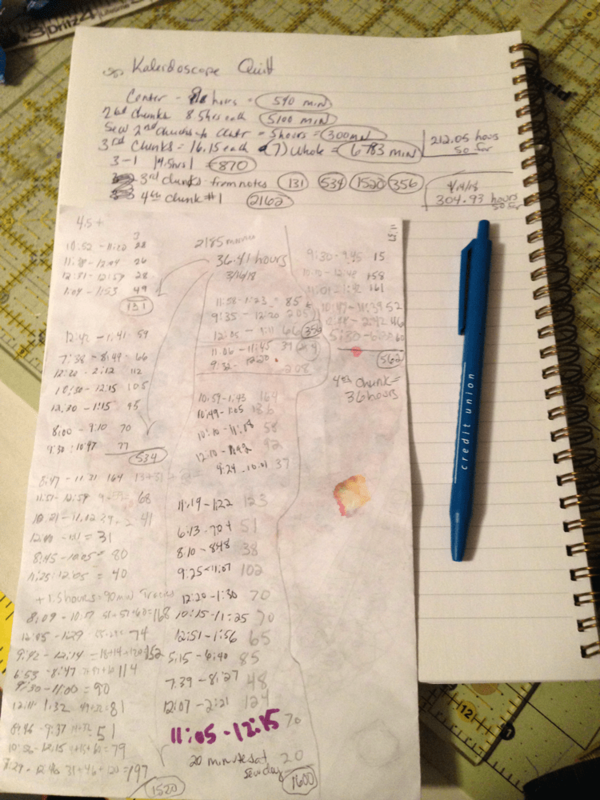 This is where I have to put a little time into planning so that the quilt will be balanced. 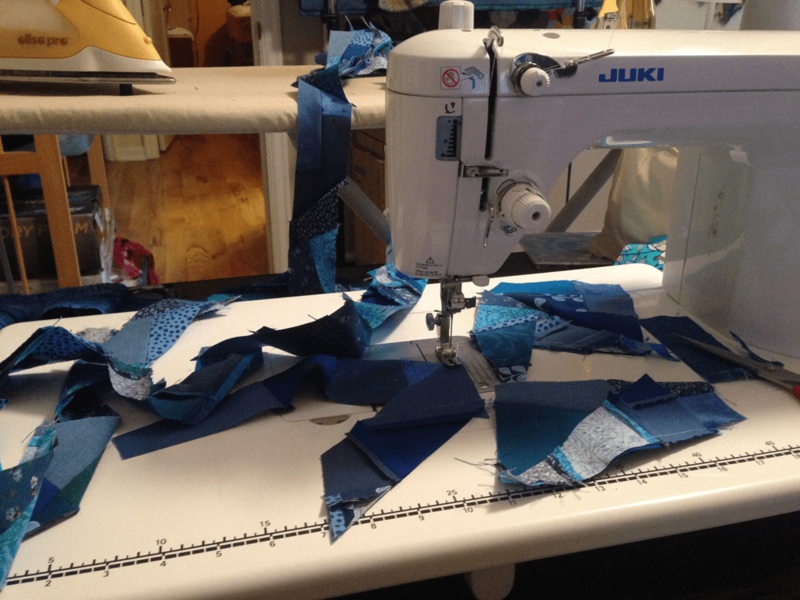 My blue fabric selection is all over the place, but I really want to make it work without having to purchase anything new. 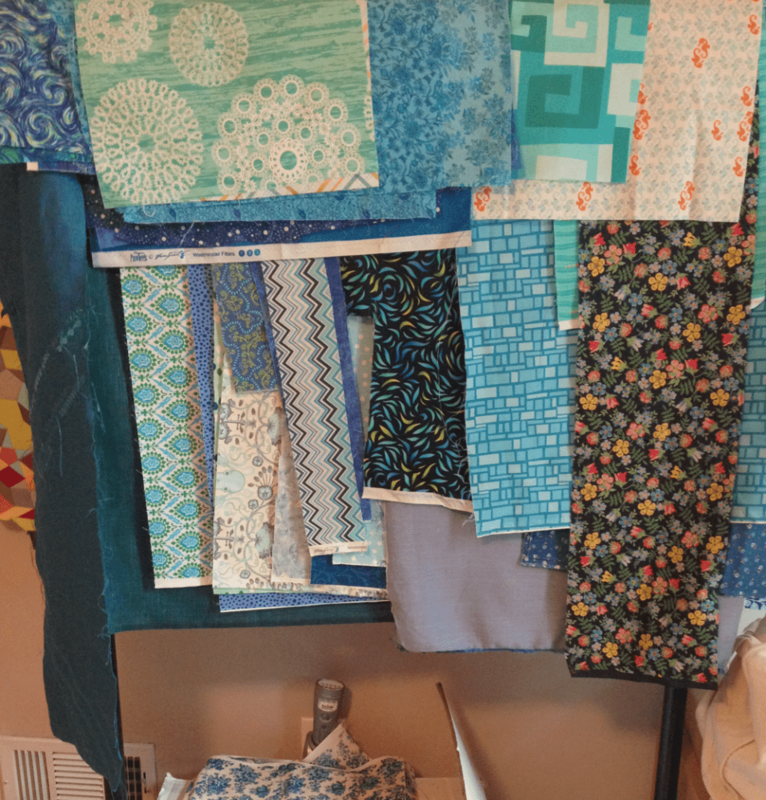 This is all my blue – and none of the pieces are over 1/4 yard, many are scraps… I have to dig though my solid stash and see how much in white and blues I have to work with. I think with the right solids, you can make anything work! I’m off to separate these into color/value order and see what’s there. Wish me luck!